Please join us for the 14th Annual Scenic Rivers Land Trust Walk for the Woods! 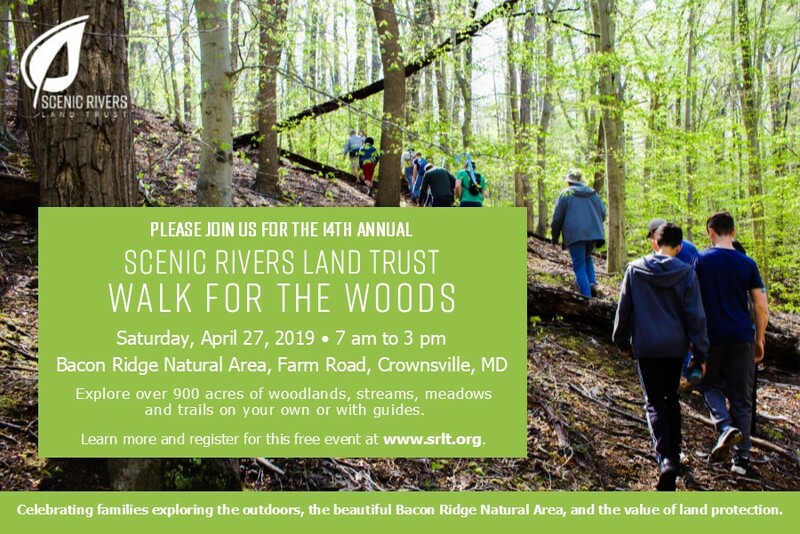 Scenic Rivers Land Trust is excited to once again partner with Anne Arundel County Department of Recreation and Parks to host a day of guided hikes and public access to the Bacon Ridge Natural Area. We hope you can join us for a wonderful, relaxing day of enjoying our local woods! As in years past, we will have a variety of guided hikes, including bird watching, amphibian searches, and naturalist hikes scheduled throughout the day. Walk for the Woods celebrates families exploring the outdoors, the beautiful Bacon Ridge Natural Area, and the power of land protection to provide quality of life, wildlife habitat, and Chesapeake Bay and River health. Scenic Rivers Land Trust has been promoting the protection of, and public access to, Bacon Ridge Natural Area for over a decade. This 900+ acre area is the centerpiece of the South River Greenway, a rare 4,000+ acre area of intact forest in Anne Arundel County. Admission is FREE! Pre-registration for guided hikes will open in early April. Pre-registration isn’t required for entry, but it does save time upon arrival and saves you a spot on popular guided hikes! We will announce the pre-registration opening via Facebook and Twitter.